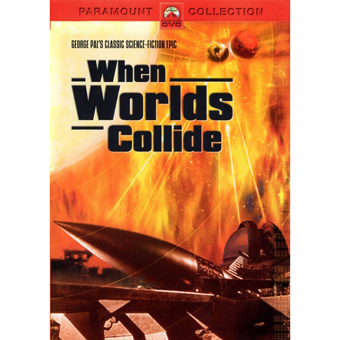 When Worlds Collide is a naive but fondly remembered science fiction epic from the dawn of the first wave of Sci-Fi movies, that brief period in time when big studios were still willing to commit relatively large budgets to the genre. A 1930s concoction probably inspired by Abel Gance's La fin du monde, this George Pal production skirts the racism of its literary source but retains its religious framework, bathing the show in the kind of sanctimony that typifies the movies of Cecil B. De Mille, for whom the script was commissioned twenty years before. The world is unaware that its days are numbered. Freelance pilot David Randall (Richard Derr) jumps into the middle of world shattering events when he delivers a set of photographic plates from a South African observatory to the New York lab of Cole Hendron (Larry Keating). The astronomical bottom line is that two rogue interstellar planets named Bellus and Zyra are going to collide with and destroy the Earth in only eight months' time. While Hendron scrambles to build a 'Space Ark' to ferry a small group of humans away from Earth and out of harm's way, Randall finds himself attracted to Hendron's daughter Joyce (Barbara Rush). He works hard on the spaceship project, all the while knowing there's no reason to take a bush pilot along to help start a new world. Before the final impact, one of the planetoids will pass close enough to Earth to cause cataclysmic earthquakes and flooding -- and there's an even chance that nobody will survive if the disasters keep the Space Ark from being completed in time. 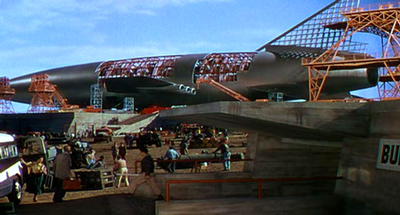 George Pal's When Worlds Collide won an Oscar for best special effects and was also nominated for best cinematography. The two depression-era novels by Wylie and Balmer on which it was based, When Worlds Collide and After Worlds Collide, are so popular they remain in print to this day. Despite the fact that they are filled with racist hatred for anything Asian and are overrun with cockeyed religious symbolism, the books were standard fare in school libraries in the 1960s. Devout producer Pal retained the book's Christ metaphor that made the stellar apocalypse into a thinly disguised Second Coming. Two heavenly bodies, the planet Bronson Alpha (or Bellus in the film) and its smaller satellite Bronson Beta (Zyra) will intersect Earth's orbit in only eight months. Representing the Old Testament Jehovah, Bellus will smash the Earth to pulp, killing every living soul. No simple flood this time, folks. But Earth has a second chance of sorts. A few weeks before the arrival of Bellus, its moon Zyra, representing Jesus Christ, will pass close by our planet and cause massive earthquakes, tidal waves and other assorted havoc. Only the Chosen Few technocrats who believe in science and are daring enough to build Space Arks to fly to Zyra will be saved. Seen today, When Worlds Collide is a charming hoot, but still a far better movie than the idiotic Armageddon. It begins and ends with the ponderous opening and closing of a Bible. Bellus, schmellus, we know who's really wiping out the Earth! The inside of the Space Ark is arrayed like a church with the faithful in the pews and the pilots (churchmen?) up in the pulpit. The chosen passengers are a technological Elect. Their peers that remain behind immediately riot like hooligans to steal seats on the only ride off the planet. The manifest for this joy ride is also amusing. Domestic farm animals are brought on board literally two by two, Noah-style, as if a single pair of animals could restore a species. That odd logic also applies to the paired-off sixteen or so couples that win the lottery to take the trip and presumably make babies for the future of mankind. Nowadays, it would seem obvious that if you could only take forty people, the best hope for mankind would be to make most of the human passengers female scientists, doctors and engineers -- all extremely young and all fit to bear children. The male component of the passenger list might only be test tubes of sperm for later artificial insemination. Why waste cargo weight on a bunch of redundant drones, when you need all the breeder females you can get? Are we saving mankind here, or is there a sexual fantasy lurking behind the Bible talk? Collide's kind of thinking would really make the Dr. Strangeloves and General Turgidsons of our present system lose some sleep! The dramatic and moral logic of When Worlds is just as thoughtlessly presented as its science. Essential Ark personnel risk their lives pointlessly taking supplies to flood survivors who are doomed anyway. During the lottery for the Ark's limited seating of forty, not one of the young engineers and scientists objects when the head of the project arbitrarily reserves space for his daughter, her boyfriend, a kid rescued from a rooftop and a stray dog! The project leader also bends the rules to allow yet another lottery loser to take cuts in the line for the Ark, to stay with her boyfriend. No wonder the losers are rioting! The multimillionaire investor that bankrolls the Ark (John Hoyt) is refused his agreed-upon ticket to ride because he's a cynical malcontent. How his riches made the Ark possible is another mystery. The movie clearly points out that, with the world ending, money no longer has any value. A cripple restricted to a wheelchair, he prefigures Doctor Strangelove when the coming of doomsday unaccountably restores his ability to walk. Since the genial, gentle George Pal was serious about his Sunday school Bible theme, this is clearly meant to be an apocalyptic miracle. You've got ten minutes to live, Mr. Moneybags, so go have yourself a stroll. 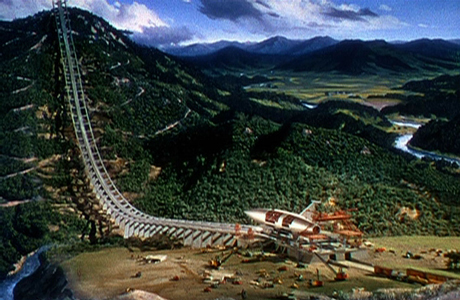 The impressive special effects wowed 'em in 1951 and can still spark imagination and wonder. The Space Ark is a beautiful silver rocket that looks great against the dramatic painted skies. The miniatures are reasonably well photographed, and besides some poorly scaled fire and smoke, most of the effects shots are breathtaking in Technicolor. The onrushing Bellus looming in the night sky is appropriately frightening. The disasters of the first passing of the rogue planets are somewhat limited in scope. A fairly successful matte of water pouring into Manhattan is followed by several glimpses of just-passable paintings of ocean liners floating next to the Chrysler building, etc. The rest of the footage is made up of every volcano, flood, and earthquake stock shot in Technicolor that George Pal could get his hands on, including bits from For Whom the Bell Tolls and Crash Dive! Paramount's DVD of When Worlds Collide is visually disappointing. As with The War of the Worlds, the deluxe laser disc of a few years back (with its isolated music track!) is still the better show. The image on this DVD is on the harsh side, with annoying fringing appearing against lines of strong contrast. A point of comparison is the crash landing on Zyra. On the laser, the wires used to pull the model of the Ark can be clearly seen after the ship comes to a standstill -- but on the less distinct DVD, they're invisible. When Worlds Collide was a Technicolor movie, and what we're looking at is probably a file negative combined from the three strips a long time ago to make Eastmancolor prints, perhaps for the reissue back in 1975. The fringing might be from color mis-registration but the expert I saw the disc with suspected an overuse of image enhancement. The film-to-tape people cleaned up the changeover cues and removed dirt from the film, but also may have used digital enhancement too strongly - the frequent shots of newspaper headlines all have annoying contrast colors outlining what should be plain black letters on white. These will be less of a bother on smaller monitors, but on a big set it looks like one's television rabbit ears need tweaking. 1. It seems that George Pal did a temporary final shot for When Worlds Collide using a quick oil study for the final vista of Zyra. He learned the lesson many a special effects vendor has learned: Paramount said, 'Looks great to us!' and ordered the cut locked. That's why Collide ends with a landscape looking like a background from a Road Runner cartoon. 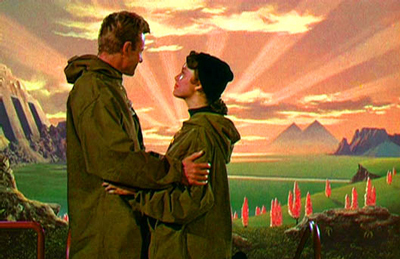 Pal had envisioned a vista combining a 3-D miniature and mattes, like one of the planet-scapes seen in the beginning of War of the Worlds. The fact that the artist added After Worlds Collide- style pyramids shows that the end painting was never intended for final use. Nobody was planning a sequel film, as the final shot implies. 2. 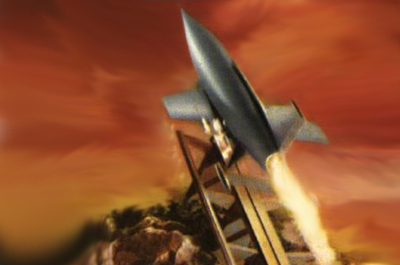 Another author criticized When Worlds Collide by claiming that a launch ramp going down one mountain and up another was a bad design because all the rocket's energy and momentum would be transferred to the ground while taking the curve, and would be wasted. The rocket, he argued, might as well just start from the bottom of the curve. But he missed a key detail: the curved ramp will work because the fuel and power being used to accelerate the ship down the ramp is coming from the sled it rests on, not the ship itself. The rocket's engines aren't ignited until the second, "Up" half of the roller coaster ramp - the rocket is already going 100 mph or so when its own engines come into use.